Do you really want to live without decadent dark chocolate and creamy peanut butter? By adding a protein punch to this classic combo, you'll never have to go hungry again! Mix all ingredients together in a bowl until you get a thick doughy consistency that can be rolled into balls. If your dough is too wet or sticky, add more of the ground almonds. If it's too dry and crumbly, add more milk one tablespoon at a time. Using your hands, roll your dough into 8-10 balls, or truffles. Melt dark chocolate and dunk your truffles using a small spoon or a toothpick. Leave a bit of the ball uncoated; that's the "eye" of the buck. 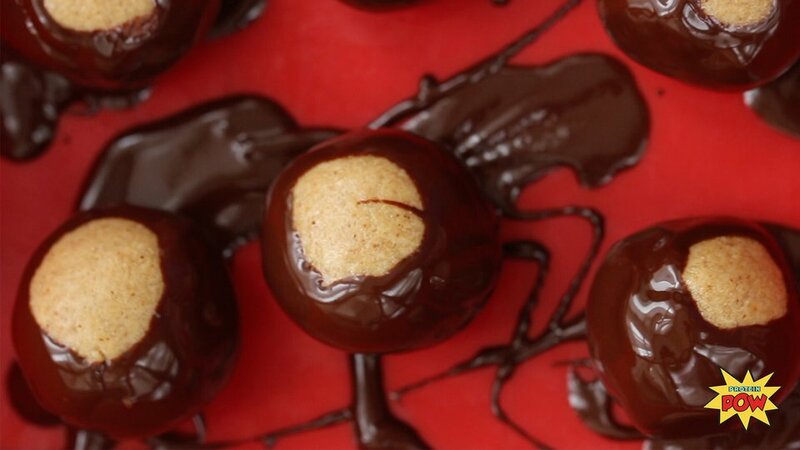 Allow buckeyes to set in the fridge for 30 minutes or in the freezer for 10 minutes.